We teach chefs how to make the best cooking better. Enroll and master the art and science of sous-vide in one of three ways: online courses, off-site courses at CREA Paris and cities throughout the world, or on-site training at your own restaurant. In addition, the CREA Test Kitchen in Sterling, VA, is available for clients to rent (at $4,500/day) for their own product demos or other culinary activities. Bring CREA into your kitchen for customized instruction. Get trained in a revolutionary culinary technique by the people who started the revolution. With CREA instructors, including the father of sous-vide Bruno Goussault, in the back of your house, you can create a highly personalized three-day learning experience for up to 14 chefs. In addition to conducting training on the sous-vide method, our team provides consulting services to every aspect of the food industry  restaurants, retailers, foodservice and food-processing establishments. From choosing the right equipment, to menu building, food cost, labor and yield analysis, our depth of experience and worldwide range of resources make CREA a key player in the sous-vide world and beyond. Use the form at the right to supply us with your contact details and a CREA representative will be in touch with pricing and more information. PLEASE NOTE: Only still photos are allowed during the class. No video or audio devices are allowed during the class. This means no iPads or other tablet devices, Smartphones, cell phones. voice recorders or cameras of any kind. 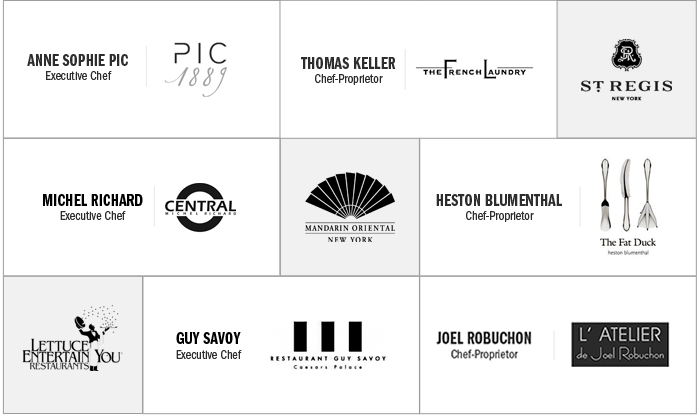 A sampling of some of the renowned chefs and restaurants trained by CREA. For pricing and scheduling inquiries, please fill out the form below. We've received your request to register for an on-site course. A representative from CREA will be in contact with you shortly to confirm your registration and to process payment. "I have learned to cook with many chefs before my training with Bruno, and since I've met him, I will never cook the same again. I will owe that to him for the rest of my life. So, thank you, Bruno!"